Requires WAC Helicopter( http://www.facepunch.com/showthread.php?p=24066850 ). As Promised, I bring you the Awesome Denel AH-2 Rooivalk, Straight from the Black Market! - Two Pilot-fired Hydra 70 Rocket pods for Soft Vehicles. - 4 Tank-Busting Gunner-Controlled Mokopa TV Missles. - And, a Nice F2 20mm Cannon, Perfect for all those Pesky Infantry. 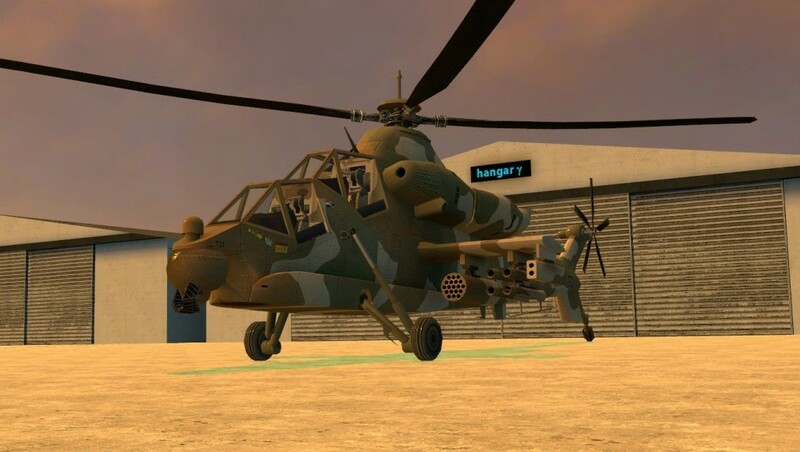 Place the 'WAC Denel AH-2 Add-on' Folder into your main Addons Folder, Start GMod and your Good to Go! Give Credit to Starchick971(I think) for Uploading such an Awesome Model! Keep up the Downloads Guys! Thank you all for Hanging in there! WAC Denel AH-2 Add-on <-- Addon folder!